After a devastating collapse in Game 2, the New York Yankees return home with their backs up against the wall in Game 3 of the ALDS Sunday night. After building an 8-3 lead, it looked like a virtual certainty that the Yankees would be able to split the first two games of the series and have all the momentum coming back to the Bronx. But when C.C. Sabathia ran into trouble, Chad Green couldn’t pick him up. Now the Yankees are facing a lose or go home scenario for the second time this postseason. Both teams have hit three home runs in this series, but for the Indians, the timing of those home runs have been key. Francisco Lindor couldn’t have timed his Game 2 grand slam any better, and the same can be said for Jay Bruce’s two long balls. Bruce helped knock Sonny Gray out of Game 1 with a 2-run homer in the fourth, and then he tied Game 2 with an 8th inning home run that gave the Indians all the momentum. Meanwhile, the Yankees hit three home runs within the first five innings of Game 2. 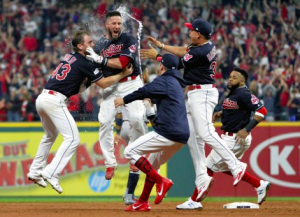 The Yankees had opportunities in extra innings to retake the lead but couldn’t come through with the clutch hit, much less another home run, whereas the Indians came up with a big hit right when they needed to. Right now, the timing of each team’s home runs is the difference in the series. In Game 3, the Indians finally have a chance to send Carlos Carrasco to the mound in a playoff game. Had he been available last year, the postseason may have ended differently. Carrasco stayed healthy all season and went 18-6 with a 3.29 ERA. He was also unstoppable in September, going 5-0 with a 1.48 ERA in six starts, including one complete game. Despite having no playoff experience and losing to the Yankees in early August, he appears ready to make this start. He’ll be opposed by Masahiro Tanaka. The Yankees were hoping Tanaka would be their ace this season, but his season did not go as planned. However, he was much better in the second half of the season, so there is some hope that the Tanaka of the past three seasons will be on display in October. Tanaka also started New York’s Wild Card Game in 2015. While he lost that game, he gained experience pitching in an elimination game, so the Yankees shouldn’t have to worry about him being fazed by the big moment. With Edwin Encarnacion likely to sit in Game 3 with an ankle injury, Michael Brantley figures to become Cleveland’s DH and an X-factor. Brantley only returned from an ankle injury himself for the final two games of the regular season. He’s hitless in five at-bats through the first two games of the ALDS, so his timing at the plate may not be back just yet. However, he’s 3 for 7 with two doubles and a home run in his career against Tanaka, so he’ll have a chance to make a real impact in Game 3. The Yankees are not going to take a 2-0 deficit lying down. New York’s bats woke up in Game 2, and despite the loss, that will continue at home in Game 3. Neither starting pitcher has great career numbers against the hitters in the opposing team’s lineup, so this could become an offensive free-for-all. While playing at home, the Yankees will get the key hits they need to keep the series alive. New York wins 10-7.